With the increased emphasis in schools on healthy eating it is important to offer facilities that will inspire students’ interest in food. That’s where Klick can help. 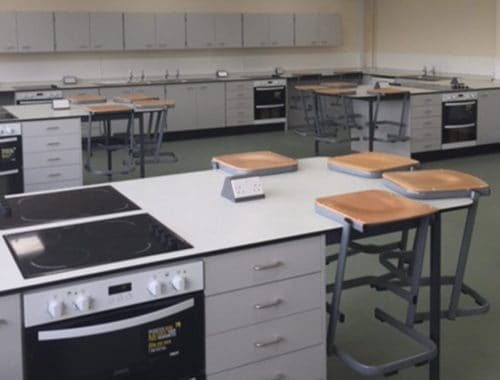 Our expertise in food technology room design means we can incorporate the relevant DfE recommendations and at the same time make the most of your available space. We will discuss your specific requirements, developing a design that will result in a well planned, modern and efficient room to cater for your needs. Food Technology facilities for schools need to allow students the flexibility to analyse, prepare and cook food as well as study theoretical topics such as diet, nutrition and the role of the food industry. Our experienced design team can advise on layouts to accommodate both these practical and theory based lessons. We offer a free service providing 3D CAD layouts for all food technology room quotations which aid visualisation of the room before making a final decision. Students benefit from a well ordered environment, designed with their learning needs in mind. 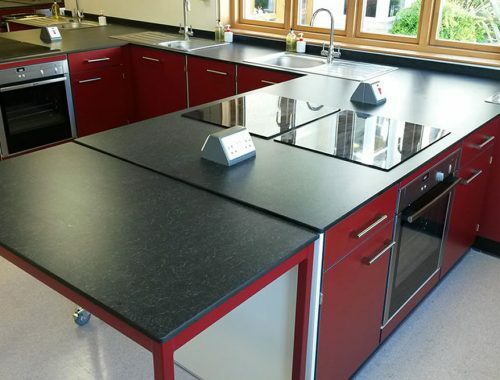 Materials such as Velstone, Trespa, Corian and Stainless Steel provide an excellent surface in food technology rooms where maintenance of hygiene and ease of cleaning are a major consideration. Our experienced designers will take into account any current health and safety legislation whilst planning your food technology room. Consideration of safe working distances around cookers and spacing so that pupils can work safely are critical when designing a room. 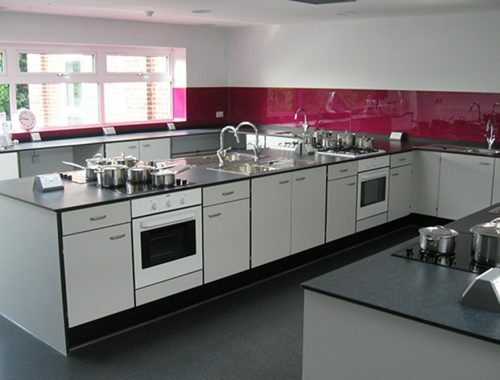 We offer a wide range of storage options to accommodate the utensils and equipment required for practical lessons. 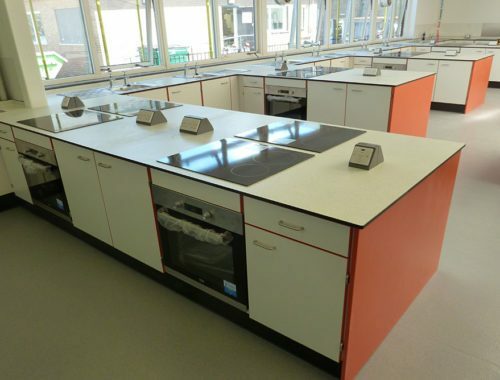 Space will be required for the storage of ingredients brought in by pupils and you will also need areas to keep coats and bags away from the practical area. 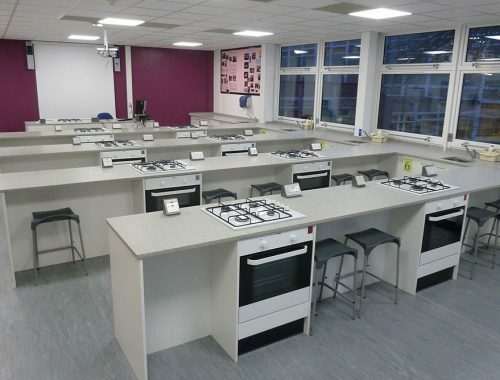 Klick can refurbish existing food technology rooms or convert any other kind of classrooms into a food room. 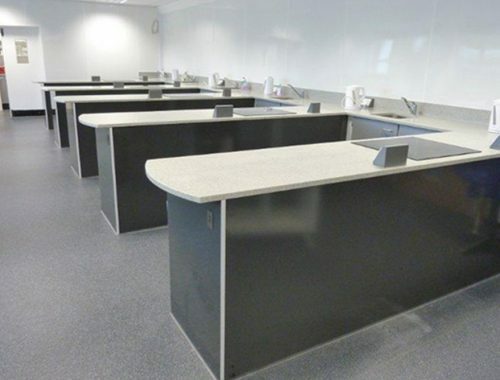 We can carry out a feasibility study to assess the most cost effective classroom to convert, bearing in mind the availability of existing services and structural considerations. Despite a tight schedule, Klick’s project management team overcame several difficulties on site and completed the works on time and within budget. 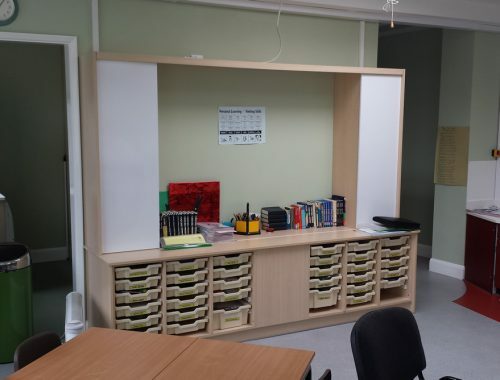 The school is really pleased with the new food room and the professional way the contract was managed. Browse our latest Food Technology Case Studies using the arrows below or click to view all case studies. Need ideas on materials or colours?